Hey Pretties! I am back with another review. This time I am reviewing Kronokare products. 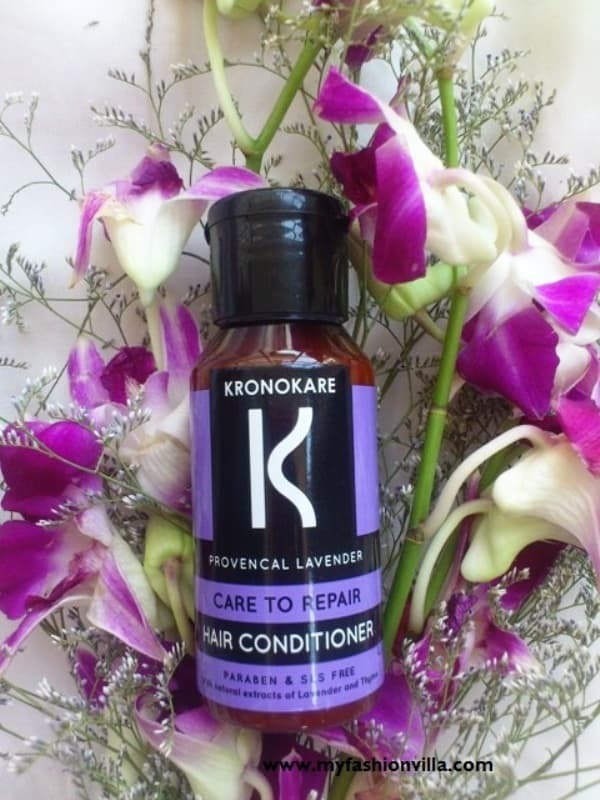 I received Kronokare Provencal Lavender Travel Kit for review. I received it around 20 back, and now I am ready with my review after using all the products came in my travel kit. Read more about what I got in my kit and my likes and dislikes. Before I review each product from kronokare kit, let me tell you which products I received in my travel kit. What Kronokare Claims about Their Products? 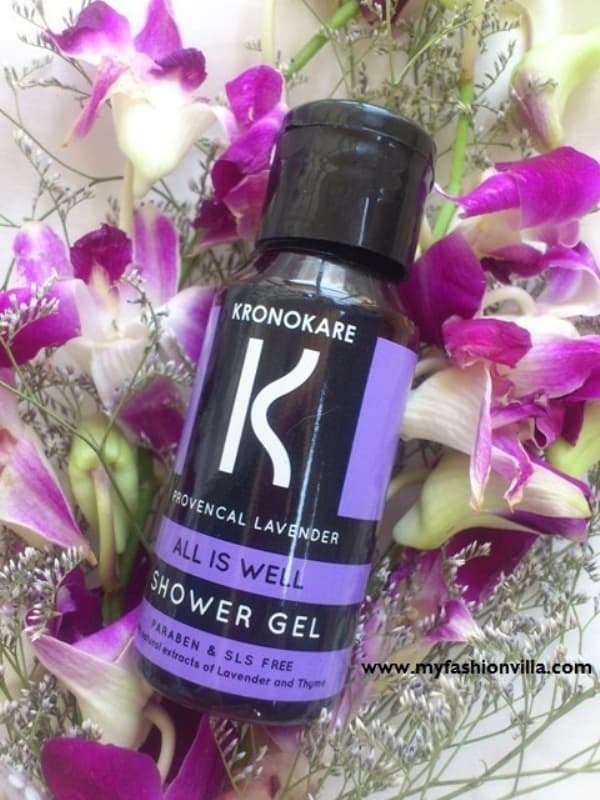 What they say About Kronokare Provencal Lavender Products? Relax, Don’t Panic! Lavender is dynamic. These products will repair and regenerate, without getting you even a single late. The oils will hydrate, the scents will bloom. Lavender is your choice to say bye-bye to gloom!! Awww!! So creative; right? I really like the way they named their products and the way they described each of their products. If you will see their website; the content is really cool & Creative! Love it. Now let’s come to the product review part! I will review each product one by one. Though I am not a big fan of soaps, but this one was Glycerine soap which I wanted to try since long. 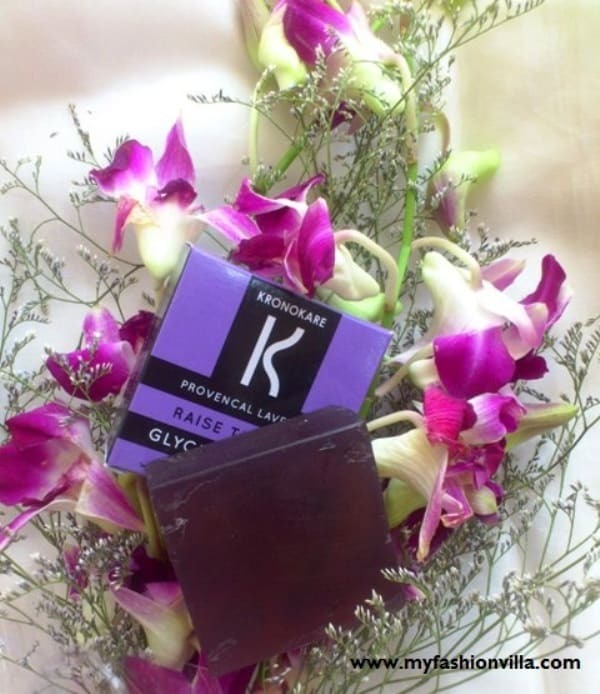 The Kronokare Lavender Soap comes in purple color & looks like made from some gel: P (yeah because it is a Glycerine Soap). It lathers really well and cleans skin properly without making it dry. It smells pure lavender, which I totally adore! 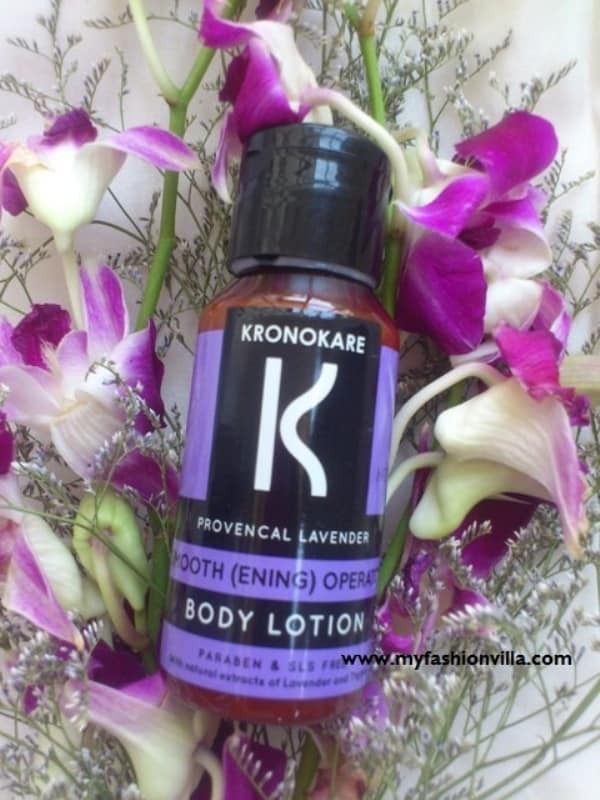 This is my favorite product from Kronokare Provencal Lavender Travel Kit. It is addictive! With this, my bathroom turns in to spa every morning. I am surely going to purchase bigger version of this shower gel. Do you still need more detail review? No.. right? Well this one is a must try product! I used this shampoo & conditioner for almost 3 weeks. Now when I am writing this review, I am left with just a coin size shampoo and a small portion of conditioner in bottle. Shampoo cleans my hair really well & Conditioner makes them smooth and manageable. However I don’t notice shine, some long term smoothness or any other improvement in hair quality with this range, though they don’t claim anything like that. So no complains!! So for me it is a good shampoo & conditioner with the plus points that it is a PARABEN & SLS Free Range. SO if you are looking for mild shampoo & conditioner for your daily hair wash, this one is a good range! Now this is my second favorite product. The texture of this body lotion is neither too thick; nor too runny. It has strong lavender fragrance! Ohhhh I Love it! The best part about this body lotion is; it is long lasting. The fragrance stays as it is for 3-4 hours easily and gives enough motorization. One application in the morning after bath is enough for whole day skin nourishment. The only minus point for some people can be, you feel like sweating! Which is temporary!! Do I recommend Kronokare Products? Yes definitely. 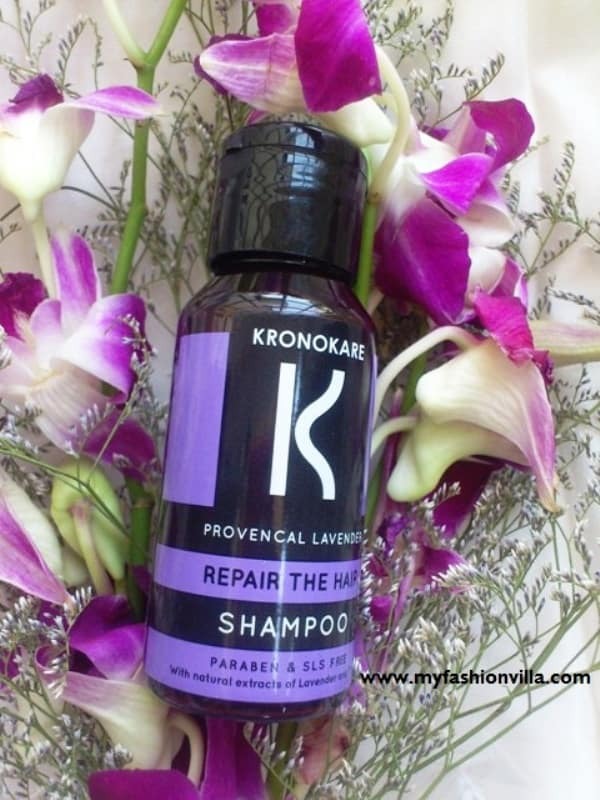 If you like natural SLS and PARABEN Free products with excellent fragrance, you must try Kronokare! Hope this review will be helpful 🙂 Let me know through comments!